5-Mukhi Rudraksha Bead represents Kaalagni shiva, it is said to control and balance five elements i.e. Agni, Vayu, Akash, Jal, Prithvi of the wearer. A body with well balanced elements is a healthy body. 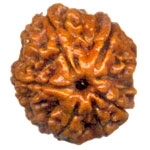 So, in other words 5 Mukhi Rudraksha Bead improves and maintains good health. Five Mukhi is ideal for those seeking mental peace and happiness. 5 Mukhi Rudraksh Bead is said to provide all types of comforts in life. Protects wearer from enemies and untimely death. This type of Rudraksha is good for both family man and saints as it provides peace of mind with positive thinking and positive views. The ruling planet of 5 Mukhi Rudraksha is Jupiter. According to astrology wearing or keeping a 5 Mukhi Rudraksha with you pacifies planet Jupiter and provides benefits associated with Jupiter. Jupiter is also known as ‘Guru’ in Indian Astrology. It represents success in every field, positive thoughts, respect. 5 Mukhi Rudraksha beads are easily available, as it is the most common form of Rudraksha that is used in rosaries and Japa Malas. It is said that 90% of beads in every Rudraksha Tree are Five-Mukhi-Rudraksha.